The search for origins seems to preoccupy people here as much as it does in Australia. Here are two old trees that are considered part of the first landscape of Britain. Yews were here before the last sea level rise of 6,000 years ago as huge trunks have been found drowned in fenland bogs. Even before I came here I saw on the map of the Wood that there were Yews marked in the north east corner. 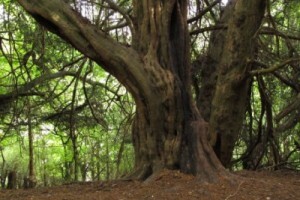 I have stumbled around in there a few times getting lost, its the wildest bit, and I have found some big old Yews. According to Richard Mabey (The Tree of the Cross In search of the Fortingall Yew, Granta 102 The New Nature Writing, Granta Publications, London, 2008, pp. 86 – 96. 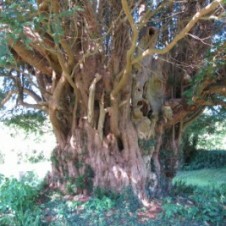 ), when a Yew gets to 500 years old it stops bothering to maintain its core and by the time it is around 1,000 it is usually hollow, putting down new roots where its branches touch the ground and even butressing itself by rooting and growing new trunks in the old core. This confounds normal tree dating processes. 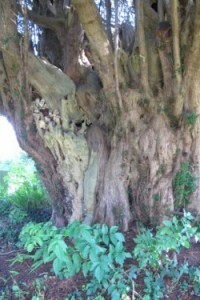 But suffice to say, a hollow Yew is probably over 700 years old . This grand old tree was in a churchyard near here. 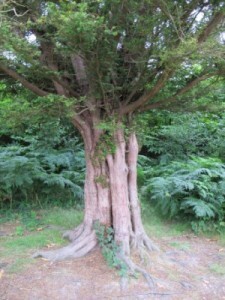 (Big old Yews are often found in churchyards) I was curious to see if it was hollow, which it was. An elderly woman weeding the path, when she saw me taking photos, said “there’s seven children in that tree ” What she meant was that the tree hollow was reputedly big enough to contain seven children ! As the church was “only” 600 years old the tree was much older. This is often the case too, the churchyard Yews predate the building’s earliest incarnation. The debate rages. 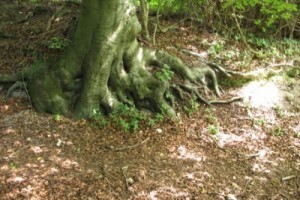 Yews have featured in European myth and recent re-imagings of European myth, and when you come across them in the Wood secreted amongst the Beeches, they truly are a serious presence to encounter and always make me stop and sit down for a while. They have been around so long as to make you giddy next to them. 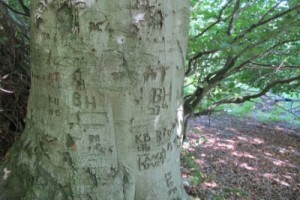 Beeches, on the other hand, seem to invariably inspire people to engrave their initials on them. They can get pretty massive too, and their roots are knarly, spreading and powerful. Beeches are “original” British trees too, being amongst the first to re-colonise after the ice retreated and before the channel flooded and stoped the march of trees back into Britain. 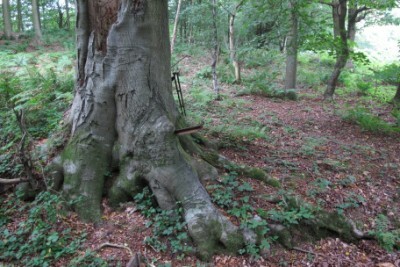 They were apparently used as way markers and border markers at the boundaries of fields, an old Beech in a hedge means a field boundary that has been there hundreds of years. In Victorian times estate boundaries were often marked very smartly with an iron fence on a raised ditch. 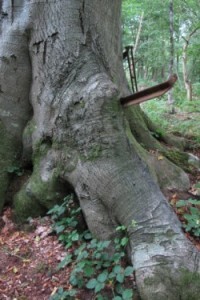 But this Beech marking the border between King’s Wood and Cutler’s Wood cares not a fig for such tiny human efforts and has swallowed the fencepost, dislodged the gate and engulfed the wire. And even in this obscure part of the Wood someone has been unable to resist the smooth blank page of the Beech bark !